Oil on Card, 33,6 x 22 cm. This little painting of a dancing woman seen from behind is a preliminary sketch for the female dancer in Marstrand’s large painting, Romans Gathered for Merriment at an Osteria from 1839, also exhibited at the museum. The figure in the sketch is barefooted and possesses a distinct grace and lightness as she balances on the edge of her own shadow. Marstrand presumably painted the figure based on a model, while the brownish-green surroundings were added later in order to situate the figure in a space. 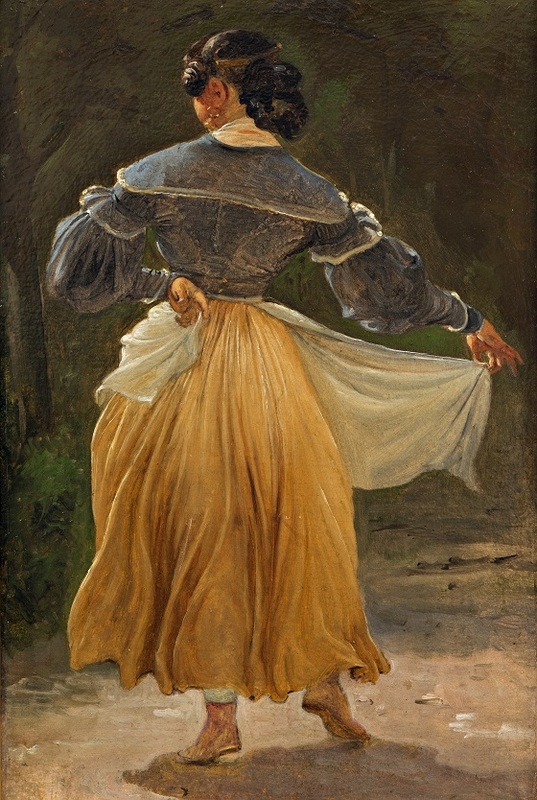 One senses the artist’s interest in the woman’s sensuality and in the fall of sunlight from in front, which softly hits the girl’s cheek, golden earring and her right hand holding her skirt. Study for Romans Gathered for Merriment at an Osteria.